Peja is a picturesque city nestled at the base of the Accursed Mountains. 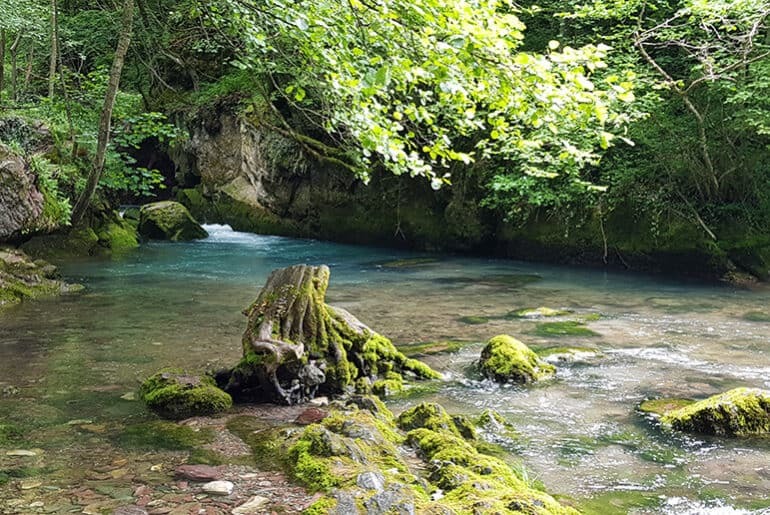 The Rugova River runs through the centre of town with a dazzling aquamarine hue. The city makes a good base for exploring the mountains with numerous hiking opportunities and the old town has been wonderfully preserved. 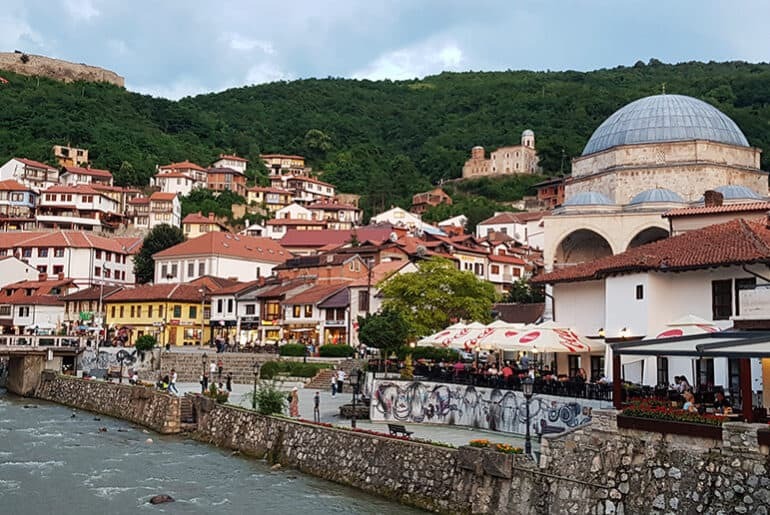 Here are some of the best things to do in Peja, Kosovo. Our first stop was the Old Bazaar in the centre of Peja. The bazaar has been pedestrianized, so was great to ride our bikes through. The shops here were disappointing though, all sporting cheap chines knock-off clothes, t-shirts, and soccer shirts. There were a couple of cafes and a carpet shop, but this definitely isn’t a place to come buy travel souvenirs. 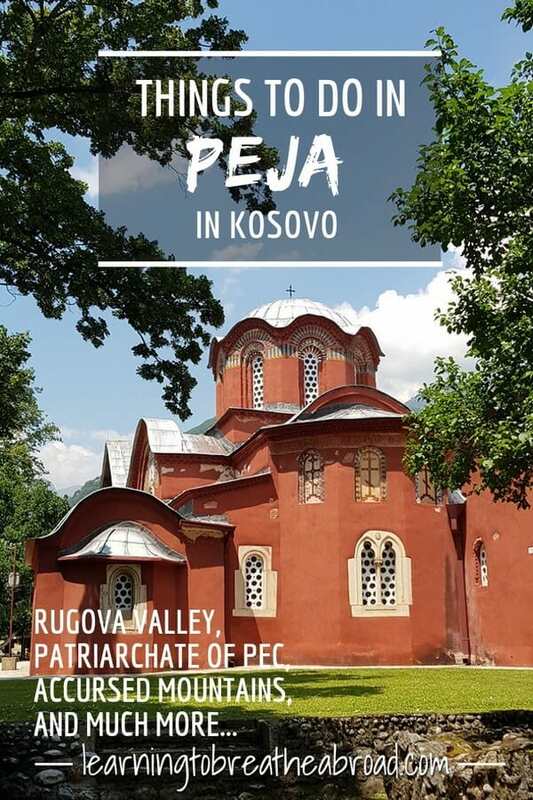 Next stop was the Patriarchate of Pec, a 13th Century Monastery that has been classified as a UNESCO World Heritage site. We were stopped at the main gates by NATO soldiers who required me to leave my passport with them before entering the Monastery. I wasn’t so happy about this but apparently Albanian rebels have been making attacks on important religious sites, hence the guards. On arrival in the monastery grounds, we were greeted by a Catholic-Orthodox Nun, dressed in black from head to toe. She kindly gave us a brief history and a scarf to cover my bare knees. I have never been in a church so completely covered in beautiful ornate freezes. They were all depictions of the life of Saint Nicholas and covered from the floor up and across the vaulted ceilings. Sadly, I was not allowed to take photos, so you’ll have to take my word for it. In the garden where moss and lichen covered old ruins and the oldest raspberry tree in the world! It was so huge and so old, that it numerous beams of wood holding up the branches. Our next stop, the Accursed Mountains! Don’t you love that name? I kept saying it all day until Tai nearly boxed me – lol! It kinda conjures up wizards and spells and demons and the road was almost that evil! We drove through the Rugova Canyon, alongside the Rugova River, with the road snaking it’s way along the same twists and bends as the river. The rockface had been chiseled away to make tunnels and place for the cars to pass. The road was narrow and the cliffs hung right over the road, so being on the inside lane was super scary and I was positive the rocks were going to hit our roof. Not to mention the relentless oncoming cars that had me grinding to a halt as the careened past. The Accursed Mountains or the Albanian Alps, rose dramatically on either side of the narrow gorge and the scenery was spectacular. The valley then widened slightly giving rise to thick pine forests and perched right on the very tops of the mountains were patches of green lawn and a splattering of tiny chalets, indicating little villages. How they got up to those high points is beyond me! There were a few gravel sideroads, but I wasn’t feeling brave enough today. When the asphalt road ended, we decided to stop for lunch. The town was called Kuqishte, but apart from the restaurant and 2 signs for hotels, there wasn’t anything more to signify that people actually lived here? Amazingly enough, the waiter spoke some English and when handing me the menu, told me to connect to their wifi so I could translate. And so I learned that Google translate doesn’t do food stuff too well. Under their specialties, I could have had a plate of “sleep”! After our last few days, I could do with a bit more of that but decided to rather have pizza and salad. These are pretty easy to decipher in any language and tend to be the safest options. 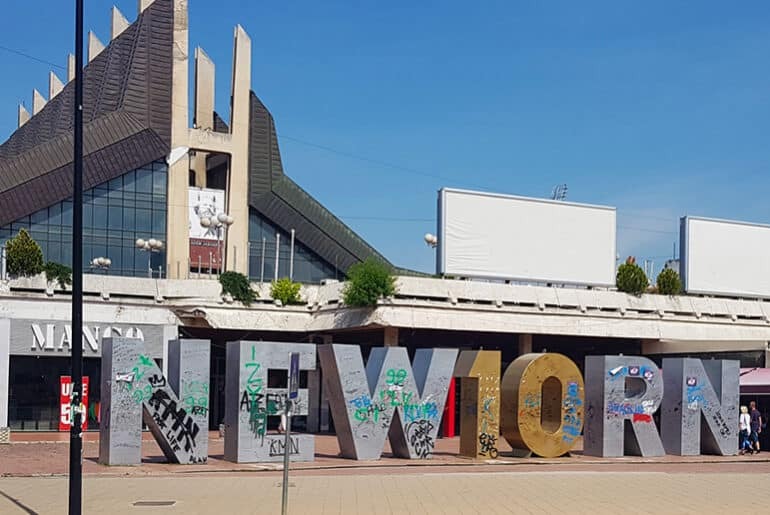 Kosovo is really small, so with only 85km from where we were in Peja in the West to get all the way across to the capital in the East, off we set for Prishtina. The locals do drive like nutters and the overtaking is terrifying to watch, but we plod along at our 60km per hour while remaining on high alert. Today’s 85km took us just over 2 hours! We needed to do some work, so we grabbed our computers and stopped at the first nice restaurant we came across. Trust us to find THE most expensive place in the whole city! Well, that’s what the menu looked like. Although, by the time I looked at the menu, we had already set up our computers and wifi and found places to plug in, so we couldn’t really leave. Our final bill, after 2 hours of working there, was for one large bottle of water! And it cost 2.5 Euros for that! To put that into perspective, our pizza for lunch cost 2.50 Euro!! A quick 25minute drive from Peja is the town of Radac and stone’s throw from there is the White Drin Waterfall. Set in an incredibly scenic ravine, the waterfall cascades down through a forest with walkways and wooden bridges for visitors to easily access the beauty of the river. You can also do the short and rather steep hike up to the Sleeping Beauty Cave. The White Drin Waterfall is quite popular with the locals on the weekends, so make sure to get your spot for lunch at one of the restaurants before they fill up. There are a few restaurants, one overlooking the river, one above the waterfall and the Trofta E Drint restaurant is at the main parking lot. All are famous for their fresh trout, but Trofta E Drint restaurant has big pools with trout so you can almost choose the fish for your plate. For us, one of the biggest drawbacks of Kosovo is that there are no campsites or camper stops. This means we can’t get electric hookups, can’t find places to fill up with water and most importantly, we have nowhere to empty our chemical toilets!! At least our gas is working like a charm on the fridge and our solar panels are supplying us with enough power to keep the lights on at night. It does mean we end up sleeping in some strange places. Tonight we are in the big parking lot next to the stadium. It is a paid parking which means we have some security, but right now we are sandwiched in between a bunch of buses. Not the most beautiful place to camp, but at 2.50 Euros for 24 hours, we’ll take it thanks! We stayed at the Stadium in Prishtina. There is a huge parking lot at the stadium with a 3-minute walk into the center of town. Great location and especially for only 2.50 Euro for 24 hours. No services – we haven’t found any services in Kosovo.